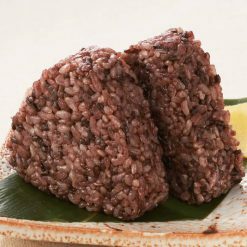 The onigiri are made from a combination of brown rice, black rice, and barley. Brown rice and barley both contain vitamins and dietary fiber, and black rice contains antioxidants. Each package is 160g, contains 2 onigiri total, and arrives frozen. Onigiri, or rice balls, are one of the most popular snack foods in Japan; and are sold at train stations, convenience stores, and supermarkets all over the country. 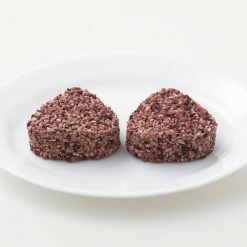 These carefully-crafted onigiri are made with brown rice, black rice, and barley; and are an easy source of nutrients we tend to be deficient in. Brown rice and barley both contain vitamins and dietary fiber, and serve to aid in promoting the body’s internal functions. One component of the pigment of black rice is anthocyanidin, a type of polyphenol. Black rice is a strong source of antioxidants, and can help you to have beautiful skin. The ratio of brown rice, black rice, and barley is 76:20:4. Nigari is used to make the brown rice soft and fluffy. To cook the three-grain onigiri in the microwave, remove the onigiri (still frozen) from their bag and place them on a plate. Cover with plastic wrap and microwave approximately as follows. In a 500W microwave, cook one onigiri for 1 minute 40 seconds, and two onigiri for 3 minutes. In a 600W microwave, cook one onigiri for 1 minute 20 seconds, and two onigiri for 2 minutes 30 seconds. The cooking times provided are for reference. Please adjust cooking times according to the model of microwave and the number of onigiri being microwaved. This product contains uruchi brown rice (domestic), black rice (domestic), barley [pearl barley (domestic)], table salt, rapeseed oil, crude seawater magnesium chloride (nigari).. Origin of ingredients: brown rice, black rice, barley (domestic). Prepared and packaged in Japan.